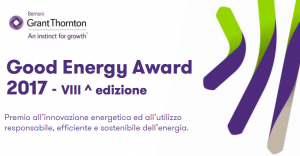 For Greenrail, winning the Energy Award 2017 confirms the effectiveness of the green economy model, in which we have believed and invested. A confirmation, which makes up for the courage of a small startup, founded by Giovanni De Lisi, who believed and still strongly believes in the necessity of changing the direction. Greener, more ecolocal, more sustainable. Investing in this innovative market turned out to be the correct direction, a proof that sustainability is not an abstract concept, but a value, which transforms into a concrete solution. Greenrail’s path does not end here. We have grown from a small startup, just like our awareness that the change is possible and duly, in time when pollution is becoming more and more of a threat for everyone. Circular economy, environmental protection, rational use of energy, ethics – we have been working on these elements, and they are our foundations. Receiving this recognition is, therefore, another motivation not to stop, to continue improving and completing our mission. Maybe one day we will be able to say that the innovation train travels also thanks to our sleepers. We would like to thank Bernoni Grant Thornton, Bosch and the whole jury present, presided by Maurizio Fauri, Fabrizio Adani (President of Gruppo Ricicla – D.I.S.A.A Universita’ degli Studi di Milano), Paolo Bertoli (President Advisory Council ANDAF)l Romolo Biondi (Sales Director of BOSCH), Maurizio Cheli (astronaut), Alberto Dossi (President of Gruppo Sapio) and Andrea Mazzolari (Researcher of Universita’ di Ferrara – Associate of CERN in Geneve). Many thanks to everyone from the bottom of our hearts.